This Sunday, diners and breakfast cafes will packed with more than just the usual church crowd. Florists will be making special deliveries, possibly to more women with wrinkled faces than young women fresh from dinner dates. Middle-aged men and college students, sisters and brothers alike will pick up the phone and make a call that maybe they haven’t in a while. “Happy Mother’s Day, Mom” they’ll say in their own different ways. Yet, how do you fully celebrate a woman who has given so much? What gift represents eternal appreciation for years of wiped tears and washed hands, for packed lunches and frantic calls to school or to teachers, for hours of labor (and not just however many it took to bring you into the world)? I am going to give my mother a bouquet of pink carnations. You see, my mother has been the mom that only the lucky have. Curved and soft at the edges, my mother used to lie a sheet across the couch when her children were sick, so we would have a cool place to rest our feverish head. She once killed a snake with a rake that had slithered out of the pile of Spanish moss I had been raking into a pile in the twilight of a Florida summer evening. She smacked the hands of my younger sister and I as we stole cookie dough from the bowl and she screamed “Call 911” as she rushed to sit my 3-year-old sister under the shower faucet after a pot of boiling water spilled down my little sister’s side. She laid down on the floor next to me as I wept hysterical tears after my boyfriend left suddenly and without notice, and she wept her own tears – on the first day of school, at the fifth grade awards banquet and in the Sun Dome when her oldest daughter kissed her cheek before her college commencement ceremony. Yet, this Mother’s Day and for the last two Mother’s Days, and I’m sure for every Mother’s Day hence, my mother is not thinking about the memories that stick out in the minds’ of the two daughters she raised – she is thinking of her own. My mother is thinking of the woman who taught her to make Italian brownie cookies, her hands covered in questionable-looking dark brown dough, who taught her how to iron a man’s shirt and how to bite her tongue, (but only sometimes), who taught her how to curse and laugh and love and sacrifice. On Palm Sunday in 2013, after a long night, surrounded by her daughters and their families, my grandmother slipped away at 8:28 a.m. After holding vigil all night, we had begun packing our things. It was as the noise of usual family business filled the room, the scuffling of shoes being slipped on and bodies grown together squeezing around each other, that my grandmother crossed the final river. When we buried Roseanna Santa, we threw pink carnations into her grave – a simple flower for a woman who lived a simple life of service and sacrifice, of love and family. 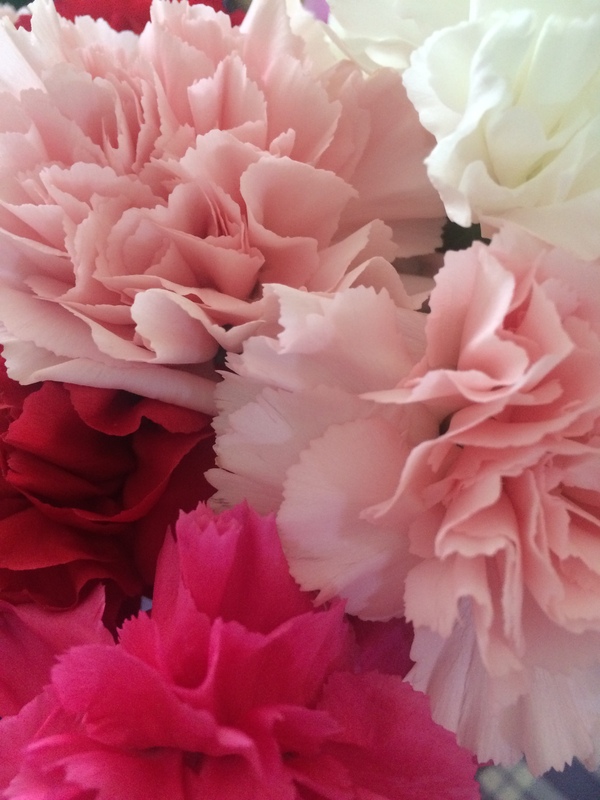 I am going to buy my own mother pink carnations as she lingers on her own memories of a mother she cannot call and thank this Sunday. A woman, who without her, my mother would not be the woman who raised me and I would not be the woman I am. Without mothers, who will cook the spaghetti sauce? Who will fold dad’s shirt just right? Who will hum the lullaby or church hymn so that it echoes in your heart across the decades? Who will wipe the tears from a toddler’s face or off her grown son? Who will quietly wash and iron our clothes, and knit our lives together as we sleep? On Mother’s Day, I’ll be buying pink carnations for my grandmother who loved them, the woman who lives through you, Mother.